Please note: this is a temporary holding page until I clear up a Wordpress glitch. Listen to my Tales Over the Airwaves! 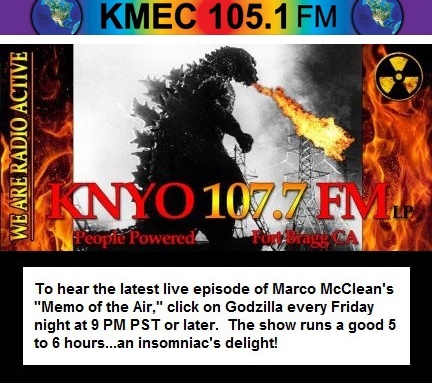 Hosted by Marco Angelo McClean, out of Ft. Bragg, Mendocino County, California, every Friday evening. As of March 3rd 2017, I am honored to have him read one of my gay tales, poems, essays or letters, maybe as frequently as every week...who knows? Or at least until he grows tired of my delusionary fits of literary twaddle. KNYO is an independent radio station, free of government or corporate intrusion. Mr. McClean's weekly show, "Memo of the Air" is an award winning (at least it should be, in my surmisal) eclectic presentation of readings interspersed with musical interludes of a most unique brand. He narrates select news articles, local community comments and essays, along with original works by clever authors, most of whom are unknown. I highly recommend you tune in to his show every Friday night, via live streaming audio. Or listen later at your convenience, to the podcast version of any previous show. That is: if you truly enjoy intelligent, thought provoking and quintessentially stellar broadcasting. But if you'd rather skip right to my own authorial braggadocio so expertly narrated by one Marco Angelo McClean, scroll down below the KNYO logo. There you'll find a growing list of clips featuring yours truly, and no one else. Click on any link that arouses you. April 21, 2017: First, Marco reads an uproarious critique of LGBT's by a misguided Catholic woman, then he reads my essay, "The New GOP Meme." 12 minutes. Click here to listen. April 14, 2017: Marco reads my Medi-Cal rant, then my queer dystopian bathroom essay, "It's the Restrooms, Stupid." 7 minutes. Click here to listen. April 7, 2017: Marco reads parts 3-6 of my time-travel adventure, "Zeke's Last Supper." 19 minutes. Click here to listen. March 31, 2017: Marco reads parts 1 & 2 of my time-travel adventure, "Zeke's Last Supper." 22 minutes. Click here to listen. March 24, 2017: Marco reads my uni-corny tale, "The Exalted Land of Andor." 9 minutes. Click here to listen. March 17, 2017: Marco reads my Luciferian fable, "The Origin of Evil." 6 minutes. Click here to listen. March 10, 2017: Marco interviews me over the telly. 38 minutes. Click here to listen. March 3, 2017: Marco reads from chapter 1 of my book, "Free Me From This Bond." 21 minutes. Click here to listen.